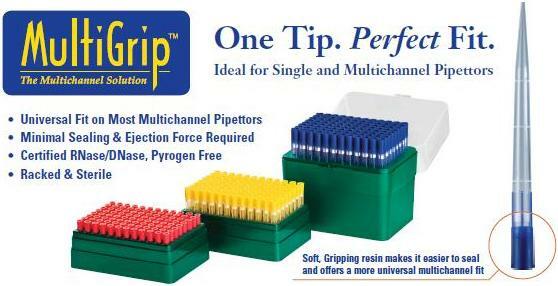 MultiGrip� pipet tips from Denville Scientific are the best tips for multichannel pipettors. This revolutionary tip is manufactured from two different resins which requires only 1/10 the sealing pressure of other leading pipet tips and reduces wear on pipettors. The soft seal offers a more universal fit, which standardizes most popular multichannel pipettors on one line of tips. MultiGrip�� The Multichannel Solution!